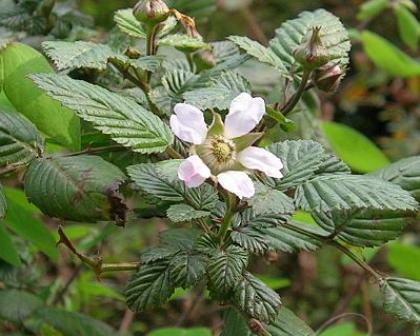 Rumu is a wild growing strawberry cold region. It grows from East Afghanistan, through Himalayan ranges of Pakistan, India and Nepal at elevations 1500 to 2800 m asl. Rumu plants are found both regions of summer rainfall and the inner dry valleys near wet spots, seepages, streams or irrigation channels. 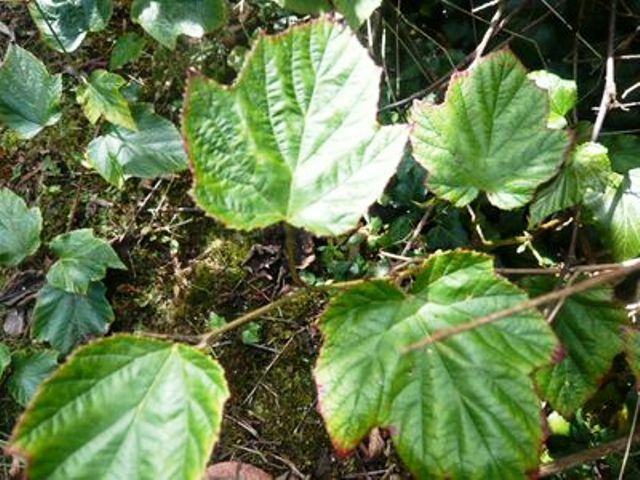 Shrubs, erect or reclining, 1–1.5 m; branchlets green, pilose and stipitate glandular; stipules linear, ca. 1.5 mm, sericeous and stipitate glandular. Leaves pinnately trifoliolate, with sparse, erect straight hairs above, below white velutinous, midrib with long straight hairs, with or without few stiff, straight or hooked prickles; petiole 2–5 cm; petiolule of terminal leaflet 1–5 cm; petiolule of lateral leaflets 1–3 mm, white sericeous and stipitate glandular; blade of terminal leaflet ovate to widely ovate, shallowly few-lobed or not, 3–8 × 2.5–7 cm, base rounded to shallowly cordate; blade of lateral leaflets ovate, only slightly oblique, 1.5–5 × 1–4 cm, base cuneate to widely cuneate, apex acute, margin doubly dentate. Inflorescences axillary and terminal, racemes or panicles, 2–7 cm, 2–15-flowered, rachis and pedicels pilose and stipitate glandular and with stiff hooked prickles; bracts linear, white tomentose and stipitate glandular. Pedicels 2–8 cm. Flowers ca. 1.2 cm across; outer surface of calyx white tomentose and pilose; sepals spreading at anthesis, ovate, 1–1.5 cm, apex acuminate; petals pink, widely obovate to rounded, clawed, ca. 4 × 3–4 mm, shorter than sepals; stamens about equalling petals; filaments linear, tapering from base to apex; pistils longer than stamens; base of style and apex of ovary white sericeous. Aggregate fruit enclosed by calyx, orange-red to red, ellipsoid, 1–2 cm long, style of drupelets persistent, white pilose; pyrenes ovoid, reticulate. Rumu fruits are juicy and taste quite good. The total soluble solids content is 13 per cent. Local people in Hazara district of Pakistan collect the fruits and sell, mostly to foreigners, at road sides. The fruits can also be made into a tasty crunchy jam. Juice can also be easily extracted by simply pressing the fruit.